Which London river has the longest journey to the sea? Now that's an excellent question. Every London river eventually reaches the Thames, it's just a case of how long it takes to get there. But which takes longest of all? It's not in east London. That's the half closest to the Thames estuary, so those rivers get there fastest. It's not in south London. There are remarkably few rivers along the southern edge of London, because the underlying chalk drains the water away. It's not in central London, because everything other than the Thames was piped underground years ago. So it's somewhere to the northwest. Northwest London's major rivers are the Brent, the Crane and the Colne, with the Colne marking the approximate western edge of the capital. From the map it looks likely that the River Pinn, a tributary of the Colne rising near Harrow (top left), would have the furthest to travel. But there is a thin strip of Greater London, about two miles long and less than a mile wide, which can easily beat that. It lies between Borehamwood and High Barnet, and I've shaded it vaguely yellow on the map above. Raindrops landing on this side of the watershed gather as tiny streams which flow straight out of London, away from the Middlesex scarp, forming the headwaters of the Mimmshall Brook. This peculiar river flows due north along the line of the A1(M), past Potters Bar, before joining up with the source of the River Colne in North Mymms. That's five miles outside the capital. From here our raindrops follow the Colne southwest towards Watford and Rickmansworth, before finally returning to London below Harefield. The Colne then flows south through Uxbridge to Staines where it joins the Thames, before meandering on towards central London and eventually the North Sea. By my calculations that's well over 100 miles, on an extraordinary journey from the edge of Barnet to the mouth of the Thames estuary. At one end of this peripheral strip is the village of Monken Hadley. This delightful ridgetop outpost runs north from Barnet High Street, and was the site of a major battle during the Wars of the Roses. At its heart is a long village green faced by period buildings, with quaint duckponds amid grass that's somewhat waterlogged at present. Raindrops landing on the eastern side of this watershed eventually end up in the tiny Monken Mead Brook, which becomes the Pymmes Brook and joins the Lea in Tottenham. Raindrops landing on the western side are in the catchment area of the Mimmshall Brook, so face a trip via Watford and Staines instead. The backstreets of High Barnet, to the northwest of the town centre, are attractively Victorian in parts. They stop where the Green Belt kicks in, but the boundary of Greater London runs precisely two fields further out, leaving space for tiny streamlets to be formed. 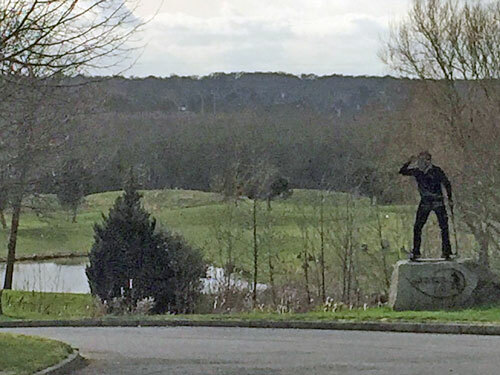 One starts amid a grubby smallholding off the St Albans Road, grazed by ponies, then immediately exits into Hertfordshire through another golf course (where Seve Ballasteros has morphed it into various upmarket water features). I did not go that way. Neither did I enter the locked nature reserve behind the Barnet Countryside Centre, because the council sold that off a few years back and a children's hospice is arising instead. But in the meadows beyond Old Fold View, success. 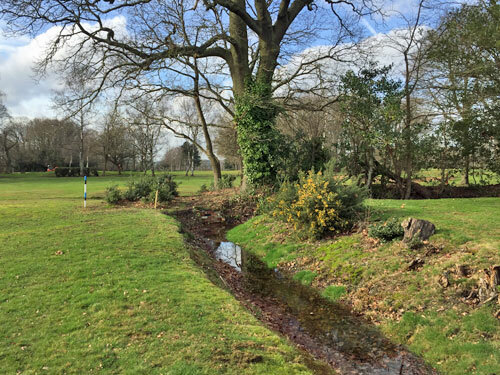 A pipe emerges at the bottom of Queen Elizabeth Boys' School's playing field, weaves through a brief woodland corner and emerges into open fields. Here at last was a definitive source of the Mimmshall Brook, whose waters were about to undertake the 100+ mile journey described earlier. These pastoral fields are leased to Barnet Livery Stables, who are willing to "tolerate local dog owners" with one or two pets but absolutely not professionals with a pack (according to Joan's angry letter tied to a lamppost). I was glad I'd brought my walking boots, because heels and hooves had turned all approaches to the tiny footbridges into a mudbath. An even longer river journey begins on the slopes below Arkley, one of London's most exclusive residential addresses. 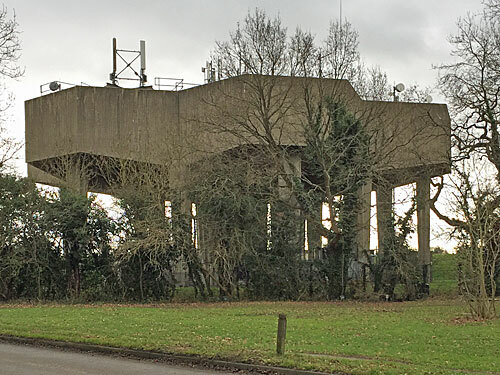 Arkley Hill is also the highest summit in north London, the peak marked by an amazing hexagonal-chambered concrete water tower. 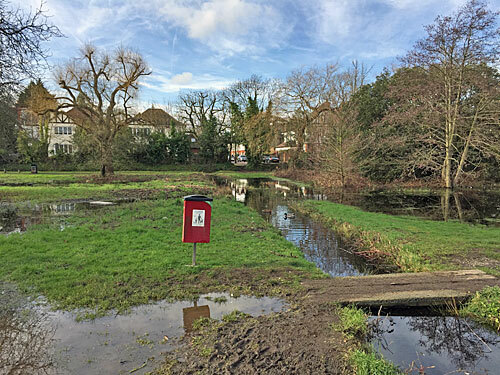 All the rain that falls to the south of Barnet Road drops steeply into the valley of the Dollis Brook, which leads to the Brent and so to the Thames, whereas rain falling to the north travels fifty miles further. Close to the water tower I found a ditch running downhill alongside Rowley Lane, and a planked footbridge into Rowley Green Common, but the bed was dry which at this time of year suggests it's nothing significant. The only important headwaters hereabouts rise amid Arkley Golf Course, adjacent to what's simultaneously the 9th and 18th hole, obscured by the covered reservoir. I had to retrace my steps and follow Arkley Lane, a former packhorse track that now peters out towards the Barnet By-pass. Past elite commuter hideaways and a string of retirement boltholes, I followed the wooded twists downhill until a silvery glint appeared behind a locked gate. This tiny tributary of the Mimmshall Brook is the London river with the longest journey to the sea, less than half a mile complete and over 100 to go. As a postscript, it's not quite that simple. 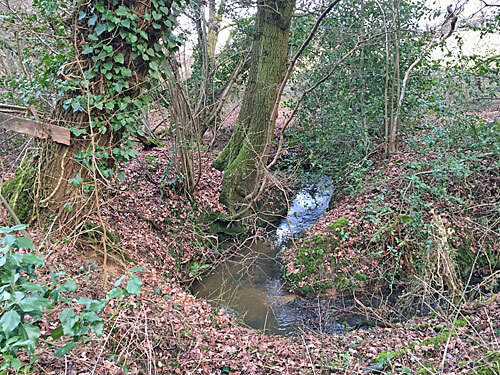 The Mimmshall Brook is incredibly unusual for southern Britain in that it disappears underground rather than flowing directly into another river. At a hamlet rightly named Water End, the river sinks into the chalk through a series of swallow holes, a landscape feature more normally associated with the Peak District or Yorkshire Dales. At times of high rainfall the holes back up and flood, overflowing along a dry channel into the headwaters of the River Colne one mile distant. In such circumstances, yes, raindrops from Barnet do indeed take a huge detour to the sea. But tests with coloured dyes have shown that most of the time groundwater from the Mimmshall Brook instead percolates gradually to the east, emerging through springs into the River Lea near Hertford. This is the largest known enclosed karstic drainage system in England, covering approximately 32 km², and just reading about it is enough to make me want to start studying physical geography again. But it also provides a route to the Thames which, though roundabout, is 40 miles shorter, and this perhaps invalidates Arkley's claim. 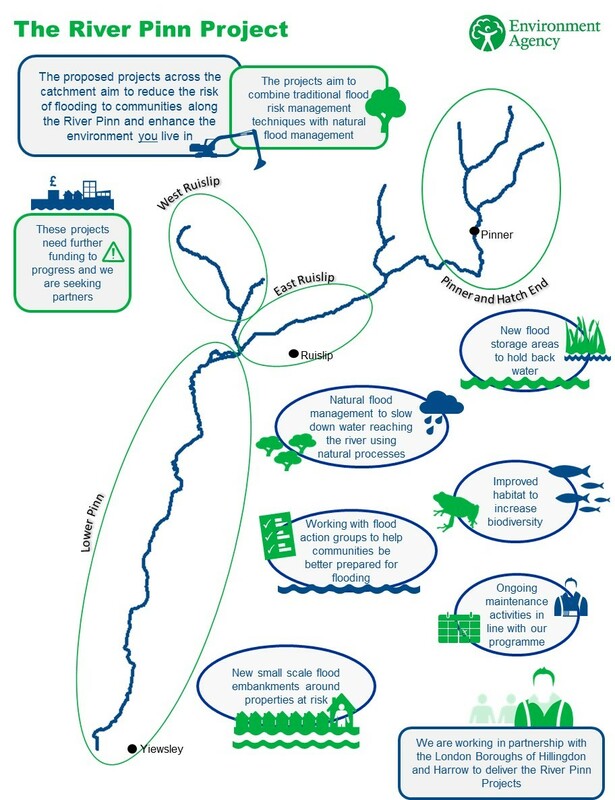 If we choose to discount the Mimmshall Brook then the London river with the longest journey to the sea is probably the set of streams that rise on Stanmore Common and cross immediately into Hertfordshire. These join up with the Tykes Water, which is Borehamwood's main river, and flow north to join the River Colne the other side of Radlett. This route's about five miles shorter than from Arkley, though still well over the 100 mile mark. Unfortunately it's complicated by the presence of Aldenham Reservoir just beyond the M1, and that's a whole other can of worms, so perhaps we shouldn't allow this either. 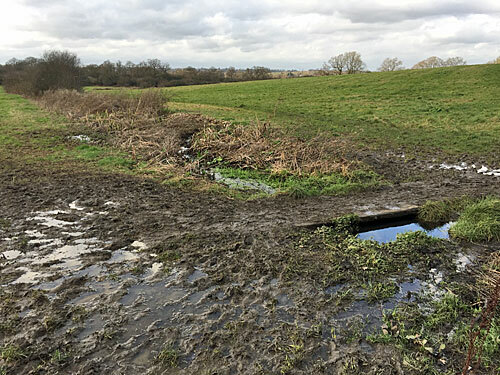 In which case the uncontroversial winner would be the River Pinn, a twelve-mile suburban backwater once known as the Ruislip Brook, which rises above Harrow Weald and finally reaches the Colne near Yiewsley. It's good for a stroll, and there's a nice pub at the summit called The Case Is Altered from which you can survey the ridiculously long journey ahead. Who'd be a raindrop?